A very late review of the Garmin Fenix 3HR which I have been using the past 2 years, almost. I got this as part of the yearly collaboration with Garmin Malaysia and Team 2ndSkin. 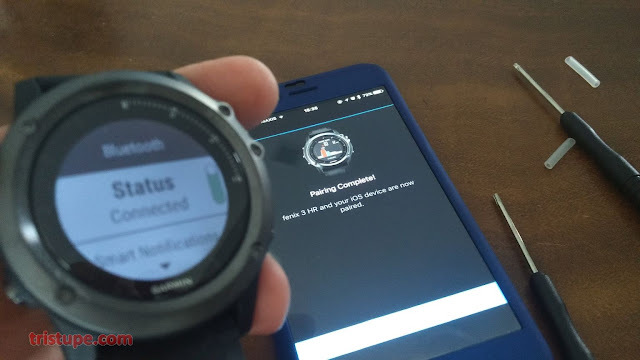 Needless to say, the relationship has always been very productive and this review of the Fenix 3HR continues the commitment I have to review products shared by Garmin. As you all may already know, this F3HR, as it is called has been supersede by the new Fenix5 variants. I do not have the opportunity to review the F5, but think of the F5 as F3 on steroids - bigger screen and bigger memories to even include a color map. The other big differences with the F3 vs F5 is that the strap is a quick change on F5, which requires no tools. Software wise, the F5 supports "True Up" which essentially allows multiple Garmin devices to be used and for all datas to be included (such as daily HR and Stress indicator). The differences between the two stops there, as far as I know. And this review, as outdated as it may sound in the world where gadgets are replaced faster than running shoes... will be about the F3HR. The photos below will do most of the talking. As you can see, the F3HR even comes with an USB wall plug, which is rare nowadays as Garmin look to cut cost by not providing any USB wall plugs. The Charger can fit into the older F3 (wiithout HR, but not vice-versa as this charging cradle has a recessed area where the HR sensor sits. So, for my F3 (being used by my wife now), we just need to maintain one docking when travelling. Cover/sticker to give the faux screen. How the items are stacked up in the box. Two chargers bundled! I am impressed. The recessed part is to house the HR sensor. Two buttons on the left. Top is for Select - start-stop. Bottom is Lap/Return. Left side is three button, top is for power/light. Middle is UP and the bottom is Down. The straps is standard Garmin... since using it for the past 2 years, I have changed the original strap out and used OEM products, mainly for color and price. First thing when you fire up the Fenix 3HR is to set which wrist you wear the watch. The reason for this is not well known even to the Garmin community. The biggest guess is the orientation of the accelometer and how it will assist the auto-light up function. Flick the wrist to get the light up. It may also be for swim stroke recognition? Some has tried this on both wrist with no reported differences to the results. I would say... just set it up as which wrist you are usually wearing your watch. The original/standard watch face is a bit boring, It was the first thing I change in all my newer Garmin devices (since 920XT). Updating with a new watch face is via Garmin ConnectIQ, which is a no fuss. The best watchface app for me is an app called "Face It". Which convert any photos you have to be your watch face. Then the pairing will be standard Garmin-style. No fuss here. Once all the setup is done, the Fenix 3HR will sync with all the items you want via Garmin Connect App, on Website and also using the Garmin Express app on computer. The Fenix 3HR is a very robust watch with Sapphire glass and I have never had a nick/scratch on the watch glass. The metal part/bezel was sturdy as well, saved a few part with discoloration due to wear and tear. the only other issue may be what appear to be "hairline" cracks on the resin of the HR sensor. While it doesn't effect the performance and accuracy, it can be quite a shock to some that has invested in this device. My advice is to bring it to AECO Technologies for it to be checked! If you are interested to get the Fenix 3HR, My advice is to get it from AECO and their authorised distributor for a peace of mind. It is currently retailing at about RM2099 (including GST).